Ladies and Gentlemen, my name is Sorm Son and I wish to be your charming Angkor Wat Tour guide. 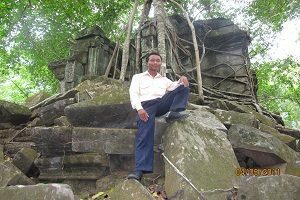 For almost ten years I have been an Official Angor Wat Tour guide and I can help make your stay in Cambodia a fun and wondrous adventure. I am a member of the local Khmer ethnic group and was a Buddhist monk for over eleven years. This background gives me a unique perspective of Cambodian life, which I will be happy to share with you as your Angkor Wat tour guide. 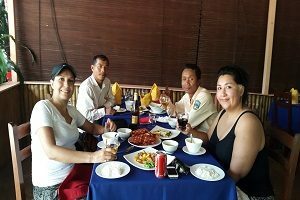 My University studies led to a Bachelor in Ed degree in English and I will help with any translation issues that may arise during your stay here in Siem Reap. I am also an expert on the history of the construction of the temples as well as their symbolism. As your Angkor Wat Tour Guide I can help with your special photographs. I will direct you to the best locations and positions. I am also willing to lend a helping hand as necessary. 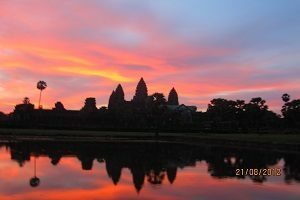 For many, coming to the Angkor Wat area is a lifelong dream and as your Angkor Way Tour Guide I will insure that your dreams are fulfilled during your trip to Wondrous Cambodia. I look forward to meeting you and hope you will let me become your personal Angkor Wat Tour Guide. As Seen on Trip Advisor!